After making a new year’s resolution to be kinder (and a more personal one about worrying less), Marcus Aurelius’ collected Meditations could not have come up in my liberal studies curriculum at a better time. Sometimes considered one of the original self-help books, it really only falls into that genre if you consider self-help in the truest sense of the word: the author wrote to help himself, not to instruct other people. Unlike today’s self-proclaimed self-help gurus, Marcus Aurelius was an emperor of Rome and had no need for either wealth or fame. He never intended for his meditations to be published, and had nothing to gain by recording his personal thoughts and philosophies, except actual Self Help, that is, he wrote down his thoughts to reflect on his character and to help himself in his never-ending struggle to be a better human being. Marcus Aurelius more or less tried to follow a Stoic philosophy, and though I’m not 100% convinced that kind of philosophy is for me (I’d rather wish for a loved one not to be ill, for example, than to wish that the illness of a loved one didn’t bother me), the humility and sincerity with which he recorded his private meditations make for a deeply personal read, and many of the struggles he returned to again and again are struggles I am familiar with myself (even though I am not a 70-year-old Roman emperor and seasoned general leading military campaigns in Germany). What ease of mind a person gains if he casts no eye on what his neighbour has said, done, or thought, but looks only to what he himself is doing, to ensure that his own action may be just, and holy, and good in every regard. Do not look back to examine the black character of another, but run straight towards the finishing line, never glancing to right or left. When people endeavor to be kind they often set out to extend themselves beyond the narrow sphere of their own lives. They endeavor to consider the lives of others, whether these “others” are halfway around the world or just around the corner. Kindness is often synonymous with an expansion of awareness of and concern for the lives and actions of other people. This is fantastic stuff, however, “thinking about others” isn’t always a good thing. Sometimes when I think about others, I end up thinking about climate change skeptics, and Stephen Harper, and Vladimir Putin, and ISIS, and MRA groups, and oil companies, and rotten CEOs who take home huge bonuses while their employees take home pay cuts. I also think about rude people on the bus, or trolls on the Internet, or acquaintances whose behaviours/opinions I disapprove of, or an argument I lost a year ago that still cheeses me off. And it’s not helpful. Teachers used to say “Keep your eyes on your own paper,” and I think I need to do a bit more of that, figuratively speaking. It’s not that other people don’t matter, it’s that my own behaviour does not, and should not, depend on what they do. There is a stream of things entering into being, and time is a raging torrent; for no sooner does each thing enter our sight than it has been swept away, and another is passing in its place, and that too will be swept away. All that you see now will very swiftly pass away, and those who have watched it passing will swiftly pass away in their turn, and he who dies in extreme old age will be brought to a level with one who has died before his time. Whether it happens in sixty days or sixty years from now, I am really afraid of dying. I’m afraid of being in pain or being scared, and I’m afraid of making the people I care about sad. I am afraid that if this life is all there is (and there is so little, or perhaps no, evidence to show that it isn’t), that I will not make it count. Marcus Aurelius didn’t worry about death, or at the very least, he made a repeated and concerted effort to make his peace with it (and he kind of had to considering he was old and in ill health and waging a war far away from home). Whether you die old or young, virtuous or not, you have lived all the life you are going to live, and after that there’s just nothing to worry about. Marcus Aurelius saw trying to be good as a way to live your life to the fullest while you were here, by acting on and developing the natural goodness he believed existed in every human being. After that–no worries. Cast everything else aside, then, and hold to these few truths alone; and remember, furthermore, that each of us lives only in the present, this fleeting moment of time, and that the rest of one’s life has either already been lived or lies in an unknowable future. The space of each person’s existence is thus a little thing, and little too is the corner of the earth on which it is lived, and little too even the fame that endures for the longest; and even that is passed on from one poor mortal for another, all of whom will die in no great while, and who have no knowledge even of themselves, let alone of one who has died many long years before. Does an emerald become any worse if nobody praises it? Or gold, ivory, purple, a lyre, a sword, a blossom, or a bush? All is ephemeral, both that which remembers and that which is remembered. Somehow the encouraging phrase, “You can do anything”, which I have heard and read so often in my lifetime, has given birth to the sneaky subconscious follow-up, “Therefore, whatever you do should be Great,” suggesting that a “regular” life is now something of a failure. The reality is that most of us will NOT do something capital-G Great in our lifetimes, that is, something for which we’ll gain recognition. Most of us will live and love and die without anyone outside of our acquaintances ever knowing we existed. At our funerals people will say, “He had a great laugh and he loved practical jokes” or, “She always loved music,” and that is just fine. Not having done something Great does not make what contributions we did make any smaller. 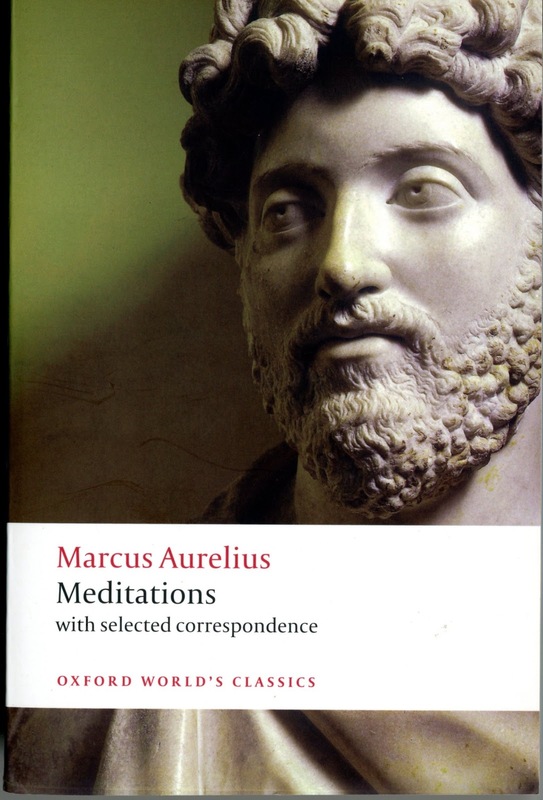 I should point out that the few quotes I’ve included are just examples of Marcus Aurelius’ writings on these issues, when in fact, the Meditations in their entirety repeat these thoughts over and over, in various permutations. If you read the Meditations as if he wrote them for the benefit of others, you’d think that the author had completely accepted death, and bad things happening to loved ones, and bad people existing in the world who will never see the error of their ways (or as I put it to TC, “Some people are going to die never knowing what assholes they really are and I have to be okay with that”). When you remember that Marcus Aurelius wrote for himself, you realize that he returned to the issues of death, and recognition, and his relationships with others again and again because he struggled with them. He would not have written about these issues day after day after day if they weren’t on his mind. And so what Marcus Aurelius gives me is permission to struggle with life, while at the same time acknowledging that nothing is preventing me from doing my best (my best being whatever I can do before encountering an obstacle that is outside of my control). Throughout, Marcus Aurelius reminds himself that all the retreat he needs from the cares of everyday life can be found in his own mind. And reading him I find, for myself, a serenity that wasn’t there before.